Membership - What's In It For You? Student Membership - What's In It For You? Katherine Beaumont holds a BS in Civil (Structural) Engineering and a MS in Mechanical Engineering, both from the University of Maine in Orono. 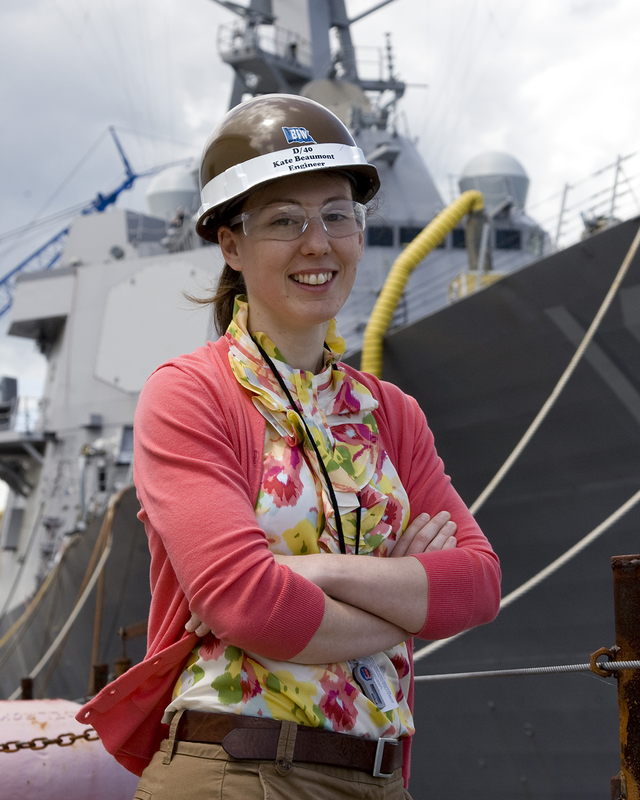 Katherine has spent the last 11 years at General Dynamics Bath Iron Works as a structural engineer in the Noise, Shock, and Vibration group. A significant portion of her work has focused on structural analysis of large equipment foundations and primary ship structure under survivability loads. She has spent the last two years identifying and analyzing potential efficiency gains in ship construction as a part of Accuracy Control. Katherine has been a member of SNAME since 2008, and is very grateful for the early leadership experience it has provided. She was an early member of the Young Professionals Committee, and has served in various local positions including chair of the New England Section. She is currently serving as a member of the SMC Planning Committee and the Strategic Planning Committee, and as the Junior Regional Vice President (JRVP) for the Atlantic North region. The medal will be for "notable early career achievement by a young maritime or ocean professional." The title will be "The Francis T. Bowles Medal." The medal will be made of gold-plated bronze, one side to show likeness of Francis T. Bowles, the other side to show an inscription of award. Eligibility for the medal, as of March 31st of the year awarded the nominee must have a minimal of five contiguous years as an Associate or Full Member, concurrent to time of nomination and meet the age limit of 35 as of March 31st of the award year. Volunteer service will be considered as a positive factor, but not required. Anyone may nominate. The selection of the nominee for the medal shall be made by the Awards Committee of SNAME requiring two-thirds vote. Notification of the award will be made following approval and the medal will be presented with suitable ceremonies at the Annual Meeting or at such time as the President of the Society may arrange. The medal may be awarded annually but not more often. Copyright © 2018 SNAME. All rights reserved.